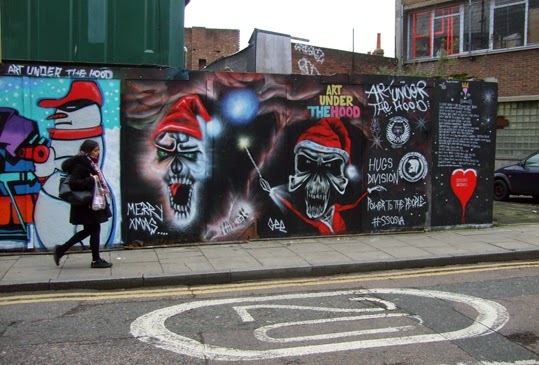 After visiting the wonderful Christmas Past exhibition at the Geffrye Museum last week, a friend I was with suggested we wander around Hoxton to look at street art. It sounded fun and the people in an artists' supply shop called Paintworks, just over the road from the Geffrye Museum, kindly gave us a map and pointed us in the right direction to find some really great urban paintings. Now, I realise street art is quite a big thing these days, especially in East London, but I was absolutely stunned by the amount - and quality - of the creative graffiti to be found on walls and hoardings. 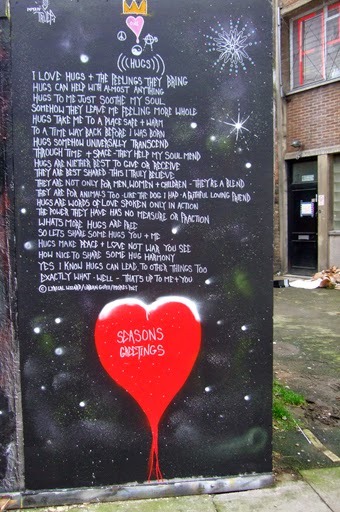 The picture at the top probably doesn't show the very best mural I saw, but it is the most seasonal. It is by Art Under the Hood, which I understand is a community project based around Hackney - @ArtUnderTheHood on Twitter. I really love the sentiment expressed in the poem shown in detail to the right called (((HUGS))): "I love hugs and the feelings they bring / Hugs can help with almost anything..." Yes, indeed they can. So have a virtual Winter Solstice hug from me. I'll be posting a few more of the photos I took of street art in Hoxton in the future.